Synology DiskStation DX517 5-Bay Expansion Unit. International Customers: All electronic products are packaged for sale in the US with US voltage. Compatibility: Synology DiskStation Servers: DS1817+ DS1517+. Package Contents: DX517 Drive Enclosure 1 x Accessory Pack 1 x AC Power Cord 1 x Expansion Cable: eSATA 1 x Quick Installation Guide. This item is brand-new, factory sealed. Compatible Drive Type: 3.5" SATA HDD, 2.5" SATA HDD, 2.5 SATA SSD. Maximum Internal Raw Capacity: 50 TB (10 TB HDD x 5) (Capacity may vary by RAID types). RAID Management through Synology DSM. External Ports: 1x eSATA Port. System Fan: 2x (80 x 80mm) Fans. Noise Level: 21.5 dBA. Power Recovery: Synchronized with the Synology DiskStation. Power Supply Unit / Adapter: 200W. AC Input Power Voltage: 100V to 240V AC. Power Frequency: 50/60 Hz, Single Phase. Power Consumption: 29.9 W (Access); 2.4 W (HDD Hibernation). British Thermal Unit: 102.02 BTU/hr (Access); 8.19 BTU/hr (HDD Hibernation). Certification: FCC Class B, CE Class B, BSMI Class B. Dimensions (WxDxH): 248.0 x 233.0 x 157.0 mm. 1 x AC Power Cord. 1 x Expansion Cable: eSATA. 1 x Quick Installation Guide. 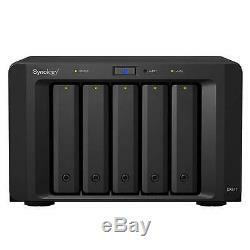 5-bay 3.5"/2.5" SATA expansion Easily add 5 additional drive bays to Synology DiskStation. Supporting both 2.5" and 3.5" SATA drives, DX517 is a flexible solution supporting on-the-fly volume expansion or serving as a local backup destination. Online volume expansion Managed from DiskStation Manager on the host NAS, the additional bays in the DX517 are immediately ready to be used once connected. On-the-fly volume expansion ensures that storage and services on the host are not interrupted during volume expansion. Hot-swappable drive tray design The hot-swappable drive trays of DX517 allow easy drive installation and replacement without powering down the system. Screwless drive tray design reduces the time needed for system setup. Dedicated local backup solution Synology DX517 can be used as a dedicated local backup solution for the Synology DiskStation. When created as a separate volume, the DX517 provides a great backup solution to its local hard disks in case of system failure. Number of Total Expansion Bays. Number of 2.5"/3.5" Bays. Number of Hard Drives Supported. Synology DX517 Drive Enclosure External. We focus on making purchasing online a pleasant experience. Our sales office is located in beautiful town of Redondo Beach, California, just a few miles South of Los Angeles International Airport. We have modeled our business much like a wholesaler. We sell in huge volume and have streamlined our operations to provide you with the best combination of price and service available anywhere. 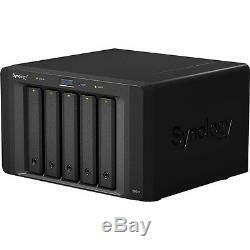 The item "Synology DiskStation DX517 5-Bay Expansion Unit" is in sale since Tuesday, June 13, 2017. This item is in the category "Computers/Tablets & Networking\Drives, Storage & Blank Media\Hard Drives (HDD, SSD & NAS)\Network Attached Storage". The seller is "beachaudio" and is located in Carol Stream, Illinois. This item can be shipped to United States, Canada, United Kingdom, Denmark, Romania, Slovakia, Bulgaria, Czech republic, Finland, Hungary, Latvia, Lithuania, Malta, Estonia, Australia, Greece, Portugal, Cyprus, Slovenia, Japan, China, Sweden, South Korea, Indonesia, Taiwan, South africa, Thailand, Belgium, France, Hong Kong, Ireland, Netherlands, Poland, Spain, Italy, Germany, Austria, Bahamas, Israel, Mexico, Switzerland, Norway, Saudi arabia, Ukraine, United arab emirates, Qatar, Kuwait, Bahrain, Croatia, Malaysia, Brazil, Colombia, Costa rica, Panama, Trinidad and tobago, Guatemala, Honduras, Jamaica, Viet nam, Uruguay.